The way Bart Decrem sees it, Swampy the Alligator has something in common with Mickey Mouse. 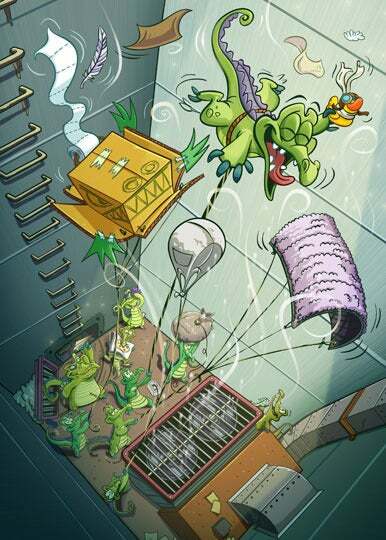 Swampy was flying high, even before Where’s My Water? became the 25 billionth download from Apple’s iOS App Store. Swampy, of course, is the star of Where’s My Water?, a popular physics puzzle game for the iPhone and iPad. Mickey Mouse needs no introduction. But just as Swampy made his debut with the September 2011 of Where’s My Water?, Mickey had to get his start somewhere—1928’s Steamboat Willie, one of the first cartoons to feature synchronized sound. That’s a noteworthy point to Decrem, the senior vice president and general manager of Disney Mobile, who thinks that Disney is poised to make the same impact in the mobile world that it did with animated movie-making nearly nine decades ago. Swampy now has a milestone of his own to boast about: Earlier this month, Where’s My Water? pushed Apple’s App Store past the 25 billion download mark. The milestone brought new attention to the game, which remains a mainstay on the App Store’s top download charts. Apps that had notched previous App Store download milestones—Bump for the one billionth download, Paper Glider for the 10 billion mark—were released by little-known app makers, a description that really doesn’t apply to Disney. Still, Decrem and his team were thrilled that their app was the one to hit the 25 billion mark. Decrem heard the news while travelling on business in South Korea on his way to China—coincidentally, the country where the 25 billionth download was recorded. While in China, Decrem visited Apple’s flagship retail store in Beijing, where store employees were giving demos of Where’s My Water? on the iPhone. “It was a big thrill,” Decrem said. 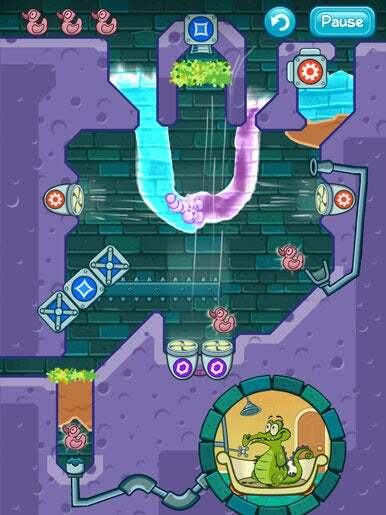 In Where’s My Water?, you use your finger to direct water into a pipe so that Swampy can enjoy a shower. The key to developing a hit iOS game, Decrem says, is to avoid being derivative—not an insignificant point in an App Store that often feels clogged with Angry Birds knock-offs. Instead, the development team behind Where’s My Water? focused on the gameplay. Half-a-dozen people spent time playing with the core mechanics behind the game—for instance, digging with your finger to move water through soil. From there, Disney Mobile was able to build out the story, characters, and world that Where’s My Water? inhabits. At the center of that experience in Where’s My Water? is Swampy, an alligator who’s awfully fond of taking showers. Players have to direct water past obstacles and to the pipes leading to Swampy’s shower to successfully solve a puzzle. Since the initial release of Where’s My Water? last fall, Disney has rolled out regular updates, adding more puzzles to the mix. A January update added puzzles from the perspective of Cranky, Swampy’s nemesis in the regular game, where players direct contaminated water to kill the algae covering Cranky’s food. Earlier this month, Where’s My Water? added 20 new free levels, giving the game a total of 200 puzzles for players to solve. Generic Company Place Holder Where's My Water?